This weekend, Fox bested the minotaur of audience indifference with The Maze Runner, which easily hustled into first place with a cool $32.5 million. The film also picked up $37.6 million overseas; given that it only cost $34 million to make—a pretty modest budget for such an F/X-heavy picture—The Maze Runner has to be considered a hit. 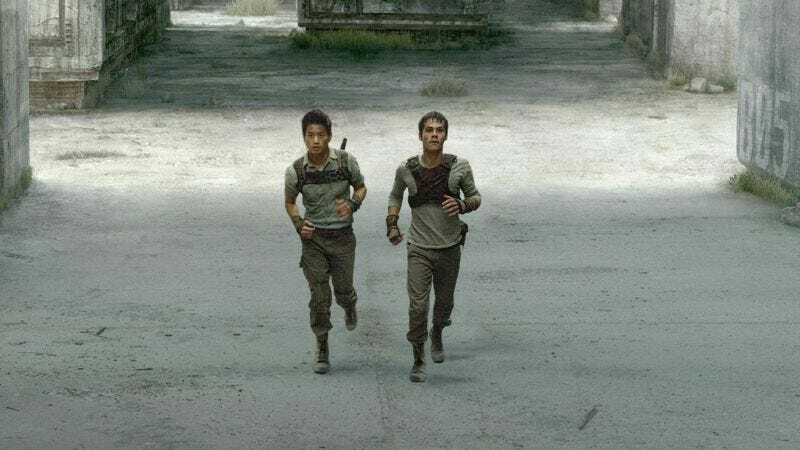 Salivating like lab mice with a taste for cheese, Fox executives have already fast-tracked a sequel, Scorch Trials, based on the second book in James Dashner’s series. The Hollywood Reporter announces that part two will open on September 18, 2015, in celebration of the one-year anniversary of Fox convincing people to see a movie about a bunch of teenagers running through a CGI maze. Making less than half as much money as said maze movie, and falling about the same percentage short of what Non-Stop opened to earlier in the year, the latest Liam Neeson vehicle, A Walk Among The Tombstones, landed in second place with $13.1 million. Are audiences tiring of the star’s very particular set of skills, or did the R rating just prevent the appropriate demographic—14-year-old boys, followed closely by enthusiastic valets—from pledging its allowance to the Neesons? Either way, Walk was still able to best the $11.8 million opening of its nearest competitor, This Is Where I Leave You. Knowing a lousy crossover when it sees one, the film’s target audience presumably approximated the film’s ensemble mojo by instead getting drunk and watching episodes of Arrested Development, 30 Rock, Girls, Justified, Friday Night Lights, Damages, Parenthood, Law And Order: LA, The Newsroom, and Parks And Recreation. And while most of the week’s new indie fare made a tiny blip on the radar, with the wonderfully twisted The Guest besting Terry Gilliam’s already-on-VOD The Zero Theorem by just $100, only one film deserved to be called an out-and-out flop: Kevin Smith’s horror-comedy Tusk, which made an insignificant $886,000 on a not-insignificant 602 screens. It’s Snakes On A Plane all over again—proof that Internet buzz is not always bankable, and that crafting a self-conscious cult movie to the specifications of a small audience is not a recipe for box-office success. America has spoken, and it’s voting #Walrusno.